“Well, I think if there’s a universe of diversity and of becoming, which is what our universe is, then all things are mortal. Nothing lasts forever in a universe of becoming. If we lived in a frozen, crystalline universe where nothing ever changed, I daresay there’d be no claws and no blood. But the nature of existence, as we see it in the universe, is that all things come to an end and are recycled. Even the most long-lasting things we know of, like stars, come to an end. The forms in which things come into being have a limited life span, so all organisms are going to die sooner or later. And it’s the very nature of animal life that animals make their living by eating plants or other animals. So, if you are going to have animals that by their very nature have to eat other organisms, you’re going to have red claws and teeth somewhere or other. Decay, disease, death, and suffering are built into the very nature of an evolutionary universe of this kind. So, if we have an evolutionary universe in which change and development are built-in, in which there is a constant becoming of forms and dissolution of forms, these are inevitable features. The God of such a universe, the consciousness of such a universe, has to encompass these kinds of processes. You could, perhaps, have a different kind of universe, as I said, where everything is frozen in crystalline unity forever. But that would be a different sort of universe, a universe without becoming, without development, and also without creativity. It seems to be an inevitable consequence of the kind of universe we have that there’s going to be red teeth and claws around, and suffering, decay, disease, and death”. ” White Evangelical Christians (in USA) are the group least likely to support politicians or policies that reflect the actual teachings of Jesus….. Before attempting an answer, allow a quick clarification. Evangelicals don’t exactly hate Jesus — as we’ve provocatively asserted in the title of this piece. They do love him dearly. But not because of what he tried to teach humanity. Rather, Evangelicals love Jesus for what he does for them. Through his magical grace, and by shedding his precious blood, Jesus saves Evangelicals from everlasting torture in hell, and guarantees them a premium, luxury villa in heaven. For this, and this only, they love him. They can’t stop thanking him. And yet, as for Jesus himself — his core values of peace, his core teachings of social justice, his core commandments of goodwill — most Evangelicals seem to have nothing but disdain”. Phil Zuckerman, “Why E vangelicals Hate Jesus”, in the Huffington Post, read the rest of the post here http://www.huffingtonpost.com/phil-zuckerman/why-evangelicals-hate-jes_b_830237.html. An alarm bell indeed! Let’s hope it is not to late to wake up. Karen E Smith, SCM Core Text on Christian Spirituality, SCM Press, 2007, p. 22. 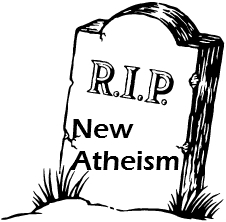 Caspar Melville, a defender of New Atheism (at least up until yesterday) seems to suggest that this movement is a FAD (my own interpretation) and might have reached its end of the road and now it is time to move beyond New Atheism. In this article he seems to suggest that New Atheism, and its prophets (where he is one among them), are wrong in a lot of things. He is not shy to also admit that there is (or there was?) an economic benefit for this a-religious movement (they did not manage to build themselves an equivalent to a ‘Vatican state’ yet). It is no doubt that the High Priest Dawkins has also pocketed a small fortune from this enterprise. I wonder how will this ‘beyond New Atheism’ look like? Suggestions please. Mark Vernon attended the event Caspar Melville mentions in his article wrote a post about it on his blog. Not sure what agenda was/is beyond this apparent ‘shift’? Whenever I hear Christians bashing ‘secularism’ I wonder what do they mean and have they really considered what secularism is before joining the bandwagon. I wonder if secularism (as a concept) has been hijacked (as humanism has been) by extreme ideologies which skew its meaning to either get popularity or to find a hobby horse. In this process the concept is emptied of it’s wider meaning and devalued. For example modern humanism traces it’s birth within the Christian context – and I am bemused how today is used with such impunity to claim exclusion of faith. Last week I heard the Pope bash again secularism as one of the ills of our society. While I agree that the Catholic Church might have an axe to grind with secularism – as the arrival of secularism announced the demise of political power for the Catholic Church – I don’t understand why this has to be a threat to Christians and their faith. The Protestant church, to my knowledge (and I am not a church historian), has been an advocate of secularism (well with some exceptions) since the Reformation. Secularism for me in simple terms means separating the political from religious and in practical terms making a safe space for all where religion does not dictate to society what to do but at the same time it is not excluded from society – an alternative to theocracy. Secularism per-se does not, and cannot, eliminate faith out of the public sphere – otherwise it looses it’s core principle – neutrality. Secularism is not atheism. Simon Barrow with other members of Ekklesia have done recently a good amount of work to try and reclaim secularism as a concept. 1. Protect free religious expression that does not directly incite violence or crimes against others or publicly and directly cause someone distress or alarm. 2. End discrimination against nonreligious belief systems or organisations. I would be interested in feedback.